4 - 4..........Dirk vom Goldberg. Yuku von Ellendonk: SchH 1 and passed the Körung 'for life' with highest rating for hardness and working drives. 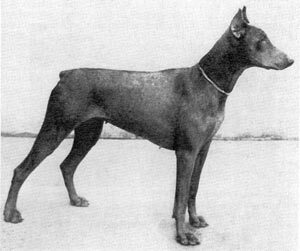 Foundation female and dam of the vom Haus Kann “A, B” litters (Amon). Yuko von Ellendonk: SchH 3 and passed the Körung 'for life' with highest rating for hardness and working drives. Yago von Ellendonk: SchH 3 and passed the Körung 'for life' with highest rating for hardness and working drives. Sire of the von Vaciweba “A” litter (Akim, Aick); vom Orakel “B” litter (Black, Belle, Bellinda) and von Bayern “E” litter (Enno).